In general, any foreign national who desires to enter the Kingdom of Thailand is required to obtain a visa according to the purpose of their stay in the country. However, there are specific countries whose citizens are allowed to stay in Thailand for a specific number of days without having to obtain a visa of any sort. For students who want to study in Thailand, they need to obtain a student visa as it will allow them to stay in Thailand while they pursue their studies. Any foreign national can apply for a one year Non-Immigrant Education visa. Citizens of China, Bangladesh, Iran, Sri-Lanka, India and Middle Eastern countries must apply and process their student visa from their country of origin. Student must be at least 12 years old and enrolled in any one of the educational programs by recognized and accredited educational institutions in Thailand. 6-month course with 100 hours of group study and 30 hours of private lessons. 11-month course with 180 hours of group study and 40 hours of private lessons. 1 year course with 18 hours of group study and 50 hours of private lessons. g. If the student is outside Thailand, the tuition fee for the selected course will be paid in full. The school or educational institution will apply for a letter of acceptance from the Thai Ministry of Education requesting a one year ED visa for the student. This letter will be submitted by the student to a Thai embassy or consulate outside Thailand. The Thai embassy or consulate will issue a one-year Non-immigrant ED visa which will be used to enter Thailand. On arrival in Thailand, the student will be permitted to stay for 90 days. The school will apply for a second letter from the Ministry of Education certifying the student’s enrolment. This will facilitate the extension of the 90 days ED visa for up to 9 months. The cost of extension is Baht 1,900. This does not require visa runs. 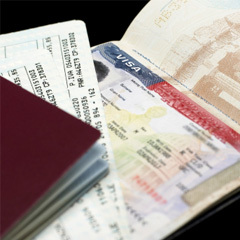 Processing of ED visa with all documentary requirements submitted will take about two business days. Once the ED visa is issued the student can begin school in Thailand. If you need legal help with your son, daughter,brother,sister, nephew or niece’s student visa, Hawryluk can definitely help you with this.